Primoreels is an international provider of cost-effective lidding solutions for manufacturers working in the dairy and water / juice industries. Primoreel solutions offer a long performance-life and are a cost-effective alternative to thicker Alu die-cut lids used elsewhere in the industry. As new products are frequently introduced to the market, standing out on a crowded shelf is important. Our products are designed to catch the eye of consumers in terms of both graphics and functionality. Our plastic solutions provide customers in the dairy industry with greater efficiency, and help avoid wasting money and materials from over-capping. Primoreels offers high-quality, innovative and flexible lidding solutions. Fitted on a large number of high-capacity packaging machines worldwide, the innovative Primoreels system protects hygiene and substantially boosts production efficiencies for clients. The system can be installed on new machines, or affordably retrofitted onto older models with die-cut / roll-stock and a preformed cups solution. Changeover to a Primoreel lidding system can be carried out in less than four days regardless of the machine brand or its size. Each machine can be customised and has individual touchscreen controls, working independently without impeding on other units involved in the operation. The easy-to-install solutions allow for seamless application of foil from the machine onto the intended container. With a minimal carbon footprint and thinner materials than traditional die-cut PET and aluminium lids, Primoreels PET lids offer an economical and eco-friendly option. Available materials can be as thin as 23µ, with each reel having a capacity of up to 60,000 lids. Despite the thinness of the material used for lids, high-quality printing can be added on an ultra-smooth surface. Another advantage is that UV-C sterilised lids significantly boost shelf-life, while stopping any contamination. Primoreel has created a membrane specifically for the packaging of ultra filtrated (UF) feta cheese. The impermeable membrane is made of a white-voided OPP film, with added whiteness and opacity, which has substantially simplified feta production. When salting of UF cast cheese, containers need to be turned twice and Primoreels has developed a two-part solution for this process. 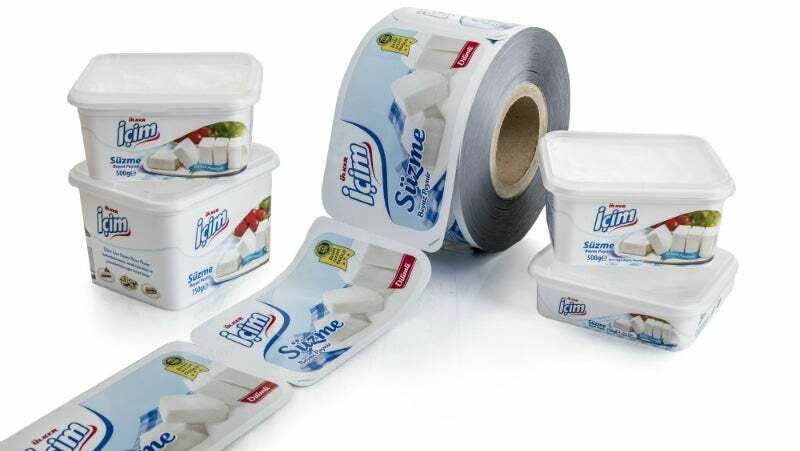 The first part in impermeable membrane has been specially developed to remove the need for cheese containers to be turned halfway through the manufacturing process. The membrane is positioned on the coagulated cheese, with salt applied to the membrane. Containers can then be sealed, turned upright, and taken into the fermentation room. The second phase deploys a new dispenser type that eliminates the substantial risk of cross-contamination that occurs during handling. Membranes are manufactured and dispensed in reels, making them easier to apply than traditional foil strips that usually come into contact with human hands. In addition, they undergo UV treatment prior to being applied onto cheeses. Reels featuring membranes usually have a sufficient amount of units to maintain up to eight hours of production, eliminating the requirement for membranes to be regularly refilled in machines. This method is highly efficient, safe and robustly hygienic throughout the inline filling, coagulation, cutting, and packaging processes. Primoreels allows cheese to be cut and placed into containers before impermeable Primoreels membranes are added. Herbs, oils and other ingredients can be easily added to cheese during this process. Founded in 2008, Primoreels has its origins in filling machinery and has more than six decades of dairy industry experience. The first product launched was a membrane for UF feta cheese production, which led to developing an advanced lidding system for dairy manufacturers that previously used Alu / PET die-cut lids or roll-stock applications. Reduce your carbon footprint with Primoreel® lids. Packaging is made easy with Primoreels lids on reels, with up to 40,000 lids on a reel and enough for one day’s production. The Primoreels® system with lids on reels has a large number of advantages for production. By replacing the traditional permeable membrane with a specially developed impermeable membrane, Primoreels® have radically simplified the production process of Ultra Filtrated (UF) white cheese. Paper and packaging company WestRock is building a new plant in Sao Paulo, Brazil, to meet the growing regional demand for corrugated packaging.